(CNS): The members of the movement promoting a ‘yes’ vote in the upcoming referendum on one man, one vote (OMOV) are warning that anyone who stays home on polling day will be voting ‘no’. As a result of the government’s efforts to defeat his own referendum, the requirement of 50% plus one voter to carry a 'yes' result means anyone who supports one man, one vote and is already a registered voter but does not go to the polls on Wednesday 18 July will be voting ‘No’. Sharon Roulstone, one of the campaign co-ordinators, urged everyone to make sure they go out and vote. The government’s opposition to one man one vote and single member constituencies means that it will be throwing all of its weight and public sector resources behind the no campaign, which will also benefit from apathetic voters. The short notice for the referendum, which has seen access to the electoral roll already closed for new voters, the choice of a summer polling day when many people are away and the decision to treat the poll like a people initiated vote requiring a 50% plus one vote as opposed to a simple majority of voters that turn out are all points in favour of a 'no' result. With an electoral roll of just over 15,000 people, the campaigners have set a goal of 8,000 'yes' votes to ensure a clear and emphatic result, but with a number of obstacles in the referendum’s path, all of the campaigners admit it is a challenge. However, Roulstone said that she does not believe the difficulties are insurmountable. “I accept that it is going to be a challenge but I feel we can prevail,” she said, adding that in the privacy of the polling booth she believed the voters would carry the day and introduce a fair and equitable system. Although in need of cash and all hands on deck, the OMOV campaign has launched into full swing with an advertising campaign, a bank account for sponsors, a dedicated website and a direct email address for voters to contact the campaigners for any information they may need. A group of supporters for the OMOV campaign also appeared on Rooster’s morning show, Cayman CrossTalk, on Tuesday morning, where they spoke about the equity, of one man, one vote and single member constituencies. Despite claims by the premier that the multi-member system is not broken so it doesn’t need fixing, Johann Moxam said he did not believe that many people really think that the current system works. He pointed out that for many years, although paid “handsomely to sit in the Assembly” several MLAs from the multi-member constituencies have been able to hide from their constituents and dodge their accountability, appearing once every four years. Appealingfor everyone to help, Moxam said that if people couldn’t give cash they could give time but the most important thing was to come out to the polls on referendum day and vote ‘yes’ in the national ballot. “Anybody who believes in transparency, accountability and equity will support this,” he said. “We are trying to bring real change as the next generation is demanding more and we will make history in the Cayman Islands,” Moxam added. For more information visit www.onemanonevote.ky or email oneman.cayman@gmail.com or contact anyone on list of individuals here to ask questions or learn more about the campaign. Additionally, I will not fall for the Premier's fear driving poor advise "My advice is going to be to stay put, hold the course for a united Cayman," he said. “Don’t let them take your votes.” He said he believed the people would not change a system that worked for one that they didn’t know. (DID WE ALWAYS KNOW THE PARTY SYSTEM WOULD WORK?) No one is taking anything from me- I want everyone to have an EQUAL VOTING VOICE. OMOV does not claim to be perfect and does not remove anyone from re-electing the Premier in his own district come next election if he gets the majority of votes. I believe and support OMOV- I will continue to follow, educate and listen. I will NOT allow fear based statements (that should be framed as questions to allow for public participation and education) drive me into an apathetic state of non-participation. I am not afraid to turn fear mongering statements into legitimate questions that should be discussed for better understanding. BTW: An education campaign should not tell people WHAT to think- merely provide factual information (that can be supported with evidence) on both sides of a matter- You had one thing right -I am no foo-fool. The 6 District Wide Elections (as we have now) is closer to National Elections (where everyone votes for all 18) than having the island split into 18 separate small enclaves. BUT I have no problem giving the smaller districts the same number of votes (4) as i have now. Let everyone in East End, North Side and The Sister Ialnds have 4 votes to send 4 reps to the LA based on 1 having to represent East End, One having to represent North Side and Two having to represent North Side. Give Bodden Town one extra seat so they also get b4 votes. After reading all these comments this is the one thought that came to mind. 'In the Country of the Blind, the One-Eyed Man is King'. It basically means; A person who is not particularly capable can attain a powerful position if the people around him or her are even less capable. This is where, I feel, we are living. We have a choice, make the right ONE. I support 'One Man, One Vote' and shall indeed vote in the July 2012 referendum. I was just thinking about something that happened in our last election where certain people who was telling voters who to vote for and nothing was done to those persons. I hope this time it will go fair. DO YOUR JOB RCIP!! I don't know. One thing about Mac – when he says don't VOTE for something, he usually sees something in the future that takes away more from our democracy. Ironically, he said NO to the constitution in 2009, and look at us today under that constitution with him being Premier. So that Mac says dont vote for the OMOV, I believe he may just be advising the public right. YES!!! The ol' reverse psychology trick!! I remember that from the Get Smart series!!! Dingdongs fell for it every time! I think either way would be unfair as if we only count those who vote then in a way those who don't vote are voting yes. So what we need to do is encourage more people to voteand this is in general not just for omov. Maybe we could follow a few other countries and start fining people if they don't vote on these things. My two cents. The reoccurring theme throughout these threads is that this referandum is to get rid of Bush and the UDP. That in itself turns off the people who would normally vote UDP in an election. The committee getting up on the stage with the PPM, Ezzard and Dr. Frank made it poiitical and one-sided despite what Ms. Roulstone and MR. McTaggart says. The committe had no business being on the stage of a PPM political campaign meeting. They should have stayed out of the fray but typical Cayman we get polarized towards party and alienate people that we shouldn't have. Now educate me as to why I must vote one way or the other, I haven't made up my mind yet. Have to tell you though so far I don't like what I see. Let's be genuine and honest and not have other political agendas hidden somewhere in the background. This so called "vote" will be decided by those who are too lazy, too busy, not registered, or only educated up to 5th grade. Who thought this up again? Unbelievable at some of the non sensical, dont care and ignorant comments to this thread. I for one will make a special trip to Cayman if needed just to vote! Caymans society has certainly gone down with morality and ethical thinking process. I will be leaving Central America to VOTE! Apathy and fear are a dictator's best friends. And Lies an oppositions. The leader of the opposition and the member from NS has spent a lot of time "spinning" and creating division in this country. Anyone who would post in reference to dictatorship in a country ruled by England is a liar or an idiot. How in the hell can this country have dictators when it’s ruled by another country with ALL of its decisions being approved by England? Further, the leader of the opposition and the PPM members need to issue and apology to the people of this country for spending this countries money to the point where, after decades, our financial planning isnow controlled by England. Just to clarify, essentially if your vote is 'no' then you get a free holiday off work and don't have to go stand in line? All of you that vote NO. Stay home or go fishnen or whatever you like. That is so cool. Whothought of this? • They ensure geographic representation. oh happy day! I can stay home and still vote the way i want to "NO". Lazy assed people. The same reason our country is going to hell today. I would hope that the current leaders of government are FAIR and makesure they WILL treat this election day as they would If it was the general elections. They too need to recruit the people out to come and vote! Radio cayman and all government PR’s should INSURE they display the same enthsiasm they would come next year. Stop the stupid bully attitude UDP. People are getting tired of the immaturity! As we would say…..”it get’n stale now”. We nah voting against the government enuh, we voting for the fairness for country! Our fore fathers and mothers worked hard to place us in the position of comfort. They didn’t set us up for failure! Show respect and LEAD! I am one of the non- naturalised status holders who has just discovered thanks to Cayman 27 the other evening that I have been able to vote since 2009 . However due to my ignorance of this I have missed the registration date April 1st, so I have no say in the upcoming referendum… a process that will affect my voting abitities for the rest of my life.. There are many more out there in the same boat. I'm sure. Given that this referendum concerns such a fundemental right , affecting so many of us,would it beyound our Governer as" head of state" to intervene and decree that the cut off date be moved forward so that any person that is currently eligable but unregistered to be an elector be allowed added to the electorial role? After all the issue is only about timing and not eligability . Or maybe an emergency act of cabinet in the spirit of fairness? There is still ample time for the required 21 days scrutiny of the new role..
well, an unfortunate lesson to learn, but it does go to show we each have a responsibility to ourselves to ensure that we are fully informed on matters and not relay on heresay, blogs, marl road, etc. Hopefull you have now registered for the next electoral list to be produced in July enabling you to vote in the next general election. Cayman 27 is wrong. You will be asked to provide PROOF OF STATUS and NATURALISATION CERTIFICATE. Elections Officer Supervisors will take copies and give them back to you along with ID and copy of your application form. See requirements from Elections Office website. Official Register comes out quarterly, so the next one is on July 1st with plenty of time remaining for those that qualify and get off their butts. Geez, this isn't that hard! When applying to the Elections Office to be registered as an elector using form 4, the following original documents are required when submitting your application to the Registering Officer for your district or to the Elections Office. Actually, Cayman News 27 is completely correct. 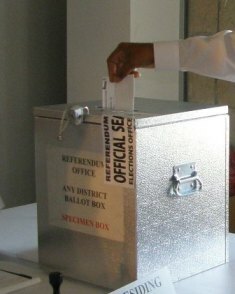 The Elections Law (2009 Revision) (which refers to the requirements of the 1972 Constitution) needs to be amended to reflect the voter eligibility criteria of the 2009 Constitution which says that you need only be a status holder to vote and do not have to be naturalised. I support OM(P)OV, but an abstention is as valid as a direct yes or no vote, and to suggest otherwise is constitutionally ignorant. Voters may wish to protest against the wording of the question being used, or may wish to object to the way Bush has designed the refererdum to absoluetly guarantee it fails. The suggestion that an abstention is a vote for the no campaign can only be made because evberyone knows the protocl has been deliberatly rigged to fail! If the yes campaign wishes to make a good attempt at a positive outcome, it cannot rely on education alone. The only thing to do now is to hire every single bus on the island and literally pick yes voters out of their armchairs on 18 July and physically deliver them to polling booths. I thank God that most Caymanians who are registered voters are not as ignorant as our leaders and their handful of moronic followers. I know the intelligent amongst us will come out and do the right thing….VOTE YES….In doing so we will also help the ignorant and uneduccated even though they vcan't see that yet. For "There are none so blind as those who WILL NOT see". Given this is not the first term for our mired prem, perhaps the collective intelligence of the electorate should be at issue? I will enjoy my holiday!!! Can't wait till may to see allthe friendly politicians walking the streets exercising again and talking to everybody, dont need stop at my house!! All these years of Bull from both parties has ruined my stomach cant handle anymore!!! Indepedent candidates step on forward!! If you want independents, especially independents who can be held accountable and obliged to properly perform their public duties, then OMOV is perfect way to accommodate and encourage independents. If, like me, you feel so strongly about constantly being let-down by the current political candidates, then perhaps you should take just a little time out on your holiday to go and vote 'yes'. Stay home you fools, you all will be the first ones to complain when things go bad here in the Caymans. One more thing my entire family can packup and leave this island we call home for some 30yrs now, but tell me something where will YOU be going.. I guess you have a "NO" plan..
My Caymanian family and friends, go and vote "YES". Judging by some of the posts here it is truly frightening how ignorant some people are as to what one fractionally educated misfit is being allowed to do to our country. God help us. I watched all to carefully at what a more than fractionally educated person did to Cayman's ecnomy between 2005 and 2009. I watched as this arrogant group almost forced direct taxation on us. I'll certainly agree that both choices are bad, but given the choice between the kind of corruptin we have today (and in 2004) or complete economic ineptitude, I'd choose the former any day of the week because that's less likely to impact me and my business. And why is it that when some people disagree with others, they have to call them ignorant. Next time you pray, pray for some tolerance. so corruption is good for big busines? who would have thought. The problem is that today we have both corruption and economic ineptitude. I don't decide for you what you should pray for and I would greatly appreciate if you could find it within you to show me the same respect. Besides the people of this country have definitely shown more than their fair share of tolerance towards our current gowerment. Corruption affects all of us, dimwit. It is like a cancer – subtle at first but gradually takes over the whole body unless it is decisively dealt with. If we happily accept it, or tolerate it, it will destroy us. Corruption impairs sound decision making in the interests of these Islands. It ensures that that the rich and well-connected get richer and the poor and disenfranchised get poorer. It creates injustice. Soon simple administrative decisions won't be made unless palms are greased. It is just a white collar form of lawlessness and lawlessness filters down from corridors of power to the street. It is no surprise that we have rapes, robberies and murders. Some form of direct taxation would serve the average Caymanian much better than the current system of indirect taxes which benefits the wealthy. E.g. the tax on fuel (which increases both your electricity bill and your gas bill at the pump) falls disproportionately on poor people and those who travel long distances to work, but it means little to the wealthy. The present govt. made that situation worse by increasing the tax on fuel. It is somewhat comforting at least that you enjoy being among intelligent people enough to show up. Bravo, Ms Roulstone! You are just the sort of candidate the PPM needs to give them some new blood and an injection of fire and intelligence. You have my vote. I will definitely vote YES to OMOV! If ever a subject has shown the number of ignorant Caymanians who have the ability to affect the rest of us it is this referendum. It is impossible to imagine how anyone can be so stupid as to not realise the benefits of One person One vote. The idiots who want to keep the feudal voting system that we have are the same ones who have been leaches on this country's economy only making money by selling the land that their ancestors left them or by illegal means. This society is being "dumbed down" to their level by a bunch of "do gooders" instead of trying to drag them up to a reasonable level of intelligence. God help Cayman…because as sure as H*** these idiots won't. I'll be staying home, and effectively voting no. I can't wait for this OMOV issue to be over. I'm sick amd tired of hearing about it now. You all couldn't leave it alone until the next election, you just had to push and push. Well, McKeeva sure showed you how to take the wind out of a sail. You should have left it alone! I hope the day of reckoning will soon arrive for the DICTATOR. There will be a free fall along the fault line and it can't come to soon. Wake up Cayman and let July 18th be another day that will go down in history. We are sick and tired of the embarrassing position we have been placed in, by a primary school drop out. Let's clean up the mess and show what sensible, educated, hardworking people can do. Vote YES. It shouldn't take money or appliances to vote Yes. I'm staying home and relaxing. I can't follow Ezzard and Arden with their foolishness. You're being asked to vote to save what little is left of your country, Mr. Green. Every country gets the government they deserve. So, if this is your attitude, stay home and do not complain about anything Government does that you dont like. In fact, stay home and dont come out, in case your stupidity is contagious. I'm not going to complain because things are a lot better than if the PPM had been in power since 2009. Crime and fuel taxes and unemployment and criminal investigations against government leaders have most definitely come a very long way since 2009. You know that is not true. Things are a great deal worse than in 2009. The current govt. has failed to achieve anything at all in 3 years. It has spent most of its time blaming the previous govt. Unemployment is higher. The cost of living is higher. Crime is higher. Taxes are higher. Climate of intimidation and fear. Reputation is damaged and getting worse. It is hard to see how the PPM would have done a worse job. The Syrians deserve to be shot at in the streets?!? You are a moron. Wish he would show you how to get your head out of there. The constitution referendum should have had the same high threshold. We have a constitution that more than half of the voting public did not want. Not right! Worse than that,we have a Premier that 87% of the voting public do not want. By staying home and not voting all they showed was that they are too lazy to vote and do not care about their country. If you are against something vote NO. If you know anything about history, you will know how women in the UK suffered to enable all women in the UK today to be able to vote, they chained themselves to the railings of 10 Downing Street, starved themselves, were imprisoned, beaten and had tubes shoved down their throats to force feed them. I personally think its an insult to those women to have the right to vote and not use it. Shameful and disgraceful. All of you who intend to stay home and not vote should be deeply ashamed that you do not care enough about your country to get up and vote. The obstacles the current government is putting in our way are nothing compared to what those women went through. Do the right thing, get up and vote. If you didn’t want it then why didn’t you vote no? The electoral office has said that 80 percent of the population voted in the last election. PLEASE do not try to tell me that those people did not vote for or against the Constitution question. Referendums, even constitutional referendums, normally require only a simple majority of those voting although sometimes a certain minimum turnout, e.g. 40%, is also required. Both would have been more that satisfied in the case of the 2009 Referendum on which 62.66% voted yes and only 36.7% voted no on a turnout of over 70% – quite solid by international standards. The fact that 44% of all registered electors voted for the Constitution does not mean that 56% did not want it. Apathy is a big factor and a country should never be held hostage by the apathetic.
"' The fact that 44% of all registered electors voted for the Constitution does not mean that 56% did not want it"! No but it certainly shows irrefutably that the majority did not vote in favour of it. As someone said its now here and we have to live with it. But mark my words we will pay dearly as country for it, whether we liked how it was handled or not and whether you believe in the BOR or not. The PPM shouldnt expect sympathy now that they are on the recieving end of this referendum voting process. McKeeva out monuervers them again! You must be a UDP supporter because you spelled "monuervers" wrong. It should be 'McKeeva out-maneuvers himself again'. If I vote no am I still apathetic…? Count me in. I am going to exercise my right to vote as a citizen. I am voting "NO". I'm comfortable the way it is and don't need any one else to tell me how much better it would be because that's what they do back where ever the come from. If they want that-they can go back and vote there. Let the indigenous Caymanians fight for what they want. Keep your Chirstopher Columbus ideas to yourself. this is an issue being put forward by your own people, no one else. We, as Caymanians, want a better and fairer election system. And just as you say, let Caymanians fight for what we want: we want single member constituencies because it is better for Cayman and for our children – no other reason. Not because some "foreigner" is looking to introduce something new. With a name like Kosher Nostra yes I'm 8 gen strong Caymanian. Assumption is a schmeckle ain't it. What I can say though, is that NOT ALL Caymanians want this one man one vote. I can say that it is obvious that the foreign enfluence (spelt with an e-for effect, as in enforcer) and position is on the one man one vote. I am "Caymanized" by being given an opportunity to live here by Grandparents. Thank G-d for that! Where I come from, there are laws that does not exist here and Cayman has that right. You have a right to vote yes or no. Either way you lose! Segregate this little country more than it is if the yes takes victory or no and be bitter the rest of your life. Then again it's your life and your right. My point is not everything that glitters is gold, regardless of the accent the presenter has-Caymanians seem to believe a British accent more than any other…one day my friend you will see who your true friends are and it's not those who have another country to move to. I can live in 4 different countries-not including the European Union. But my Grandma and Grandpa (Watler and another name-but it would be toooooo easy for you to figure me out if I told you the other name) gave me an opportunity that i will not mess up for any silly selfish victories. Could we ease up just a little bit on the pure unadulterated BS here please? We're ALREADY getting more than enough of that from our premier. Here's a suggestion, don't vote for parties come election time. OK Mr. Genius if we do not vote for members of political parties come general election time, in your infinite wisdom, how will our constitution work? How do you suppose we get a Premier and a leader of the opposition, like how the Greeks are getting a government? Get real and read my words, we have had political parties from the 1960's and they will be here long after your breath leaves you, and my breath leave me! How sad. Wish we could wipe the slate clean and start again. OMOV could facilitate this. If you we do not vote for political parties, then should we get rid of the constitutuion and ask the British Government to come and take over for a couple more decades? I would suggest that you take your head out of the sand for awhile. … sounds like a plan to me! I find it very unfortunate how Governments can play with the referendum requirements to suit their own needs. With the referendum that passed the constitution in 2009 the PPM called for a simple majority of those that actually voted, to pass the very hurried constitution. the referendum passed by 7,045 voting for a very hurried and illconceived constitution out of an electore pool of 15,338. Had it been a simple majority out of those who could vote, it would not have passed! Now the PPM are facing the same predicament they put the country in in 2009, with the UDP implementing referendum requirements to suit their needs and to ensure as best as they can that the referendum will not pass. Too bad for Cayman that neither party had the country at heart but their own best interests. How sad. Will the bars be open that day? I need to know whether or not I need to stock up. Here it is! Caymanians one chance to show everyone else how united, interested, and not too busy with other things to change their kids future for the better. If you don't help yourselves the same old crew will continue to help themselves until there is nothing but debt and corrruption. Or UK rule. If you are not a registered voter you cannot vote so i have been told, the cut off to register was April 1st. The registration form s inaccessible on the elections website. So all those planning on registering so that they can vote "yes" to OMOV are going to be sorely disappointed. I have never registered becasue it is the same old bunch of gold diggers that have been around since i was born, having just been told i will not be able to register, i guess they will continue to be around until the day i die. Well then you are only getting what your deserve. There are very few of us who have the right to vote in this country and it is our obligation, regardless of which side of the coin we are on or what position we stand for or in, to get out and vote in every election. To use the excuse that you have never registered to vote because it is the same old same old is shirking your responsibility as a citizen of this country. To then have the arrogance to be upset that when you finally feel like getting off your backside and voting and you can't because you do not even know the laws of your own country because you couldn't be bothered is a slap in the face to the rest of us who do take our obligation to make our voices heard a matter of priority. Stop whining and get ready to register to vote when you can as the elections in May will also impact this country! I'll be in Panama celebrating my "no" vote! This is the first election ever that I can actually not vote and still vote..Love it! Can't wait for my vacation in beautiful Panama. I hope you stay over there and take your Premier with you! See this is the reason we Caymanians never get anywhere. Just because this person choses to vote no the "yes" voters jump on him and beat him to a pulp..No difference than the gangs they call PPM and UDP. I say go and enjoy yourself. If you were voting no anyway what is the sense in staying home and standing in line at the polls. Instead you could be enjoying yourself rather than sweating in the hot sun. Give the man abreak. At least he is being honest. So this is about McKeeva but I thought it was about changing our electoral system not one man. If the sole reason is to remove McKeeva wouldn't it be better just to vote him out in the next election? And a no vote will take out two yes votes, so all you no people get out there. Listen why don’t we do it with the election so it can ha be. Good shot and not waste our money. Come on A laden make an executive decision. But how many times I am going to say I am going fishing. I got the holiday from work so I am going fishing. I am not in favour of no one man vote so why waste my time standing in a line in hot sun when I can be making some money. No. Apparently you aren't even a fisherman. What is there to catch here in the summer apart from grunts and a sunburn? Moron. I especially love the part about "making some money". Is there really any surprise our country is in the mess it's in with stooges like this around? I must say that the last time I went to vote it was a very efficient process. I went in the morning and there was no line. I was done in less than 15 mins. Typical self-rightious attitude. I think of me and only me, not even the future of my children! Teach your children to fish as with your attitude the future is bleak for them and Caymans future, and we might all have to fish to eat in the future. This decision is bias in my opinion! What about people in the situation like my spose whose a students off island….He is vote is a “yes” if he were here?! He should be able to do postal voting contact the voting office for detail. Where can i find a voting registration form? Preferably online. Elector's registration cards are not being issued at this time. Don't ask me why. I was told that you cannot vote until you are listed on the next update of Official Register of Electors that is supposed to come out on July 1st. Anyone that plans to vote needs to get their paperwork in long before that date (like right now). Next update isn't until October 1st! Our leader that don't believe in education because he has none, dosen't want our people to advance. Perhaps that is why he was against constutuional reform. We must break this cycle of stupidy and come out and vote YES while bringing everyone in our family. Do unto others before they do unto YOU. Our leader only cares about the wealthy and will destroy our country in the process with stupid projects like Oil refineries as long as he stays at the top of the politcal food chain. FIGHT BACK VOTE YES. Good Lord…Read what you have written before you accuse people of not having education. Your spelling and style of writing is atrocious! Spelling and style is one thing. The democratic freedom of speech of a citizen is another one. I will choose the freedom of speech side. Doesn't appear to be in your state of mind here Einstein isn't it? At least this Anonymous person speaks his/her mind. That is democracy. And I think that it is also in my right of freedom of speech to tell to that your are an (bip). This might be a stupid question, so let me apologize in advance. However, do the MLA"s have access to the registered voter list with telephone numbers, etc. I ask because in the US, there is a list of registered voters that is utlized by campaigns to ensure the base comes out to vote (registered voters list). If that is here, and I do realize this is a much smaller place, perhaps the MLA's could start making some phone calls and ensure the voters comeout. I would hazard a guess and say no, that would involve progression, something our leaders do not follow, that would be stagnation. Not stupid, but I think you are mixing up basic registration to vote with the US option of being also registered as a Democrat or a Republican.